The unfinished Vida Abundante church was packed with lines of people milling around racks of colorful clothing and homewares. 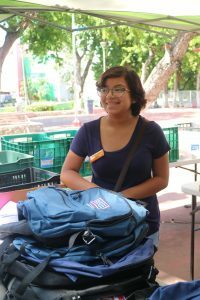 “El Gran Bazar,” a twice yearly event organized by the Friends of Cozumel, attracted huge numbers of people including those with discount coupons received earlier in the week at an FOC distribution of school supplies to families in need Proceeds will go to benefit a scholarship fund, to purchase school supplies for the coming years, future FOC endeavors and construction of the church. 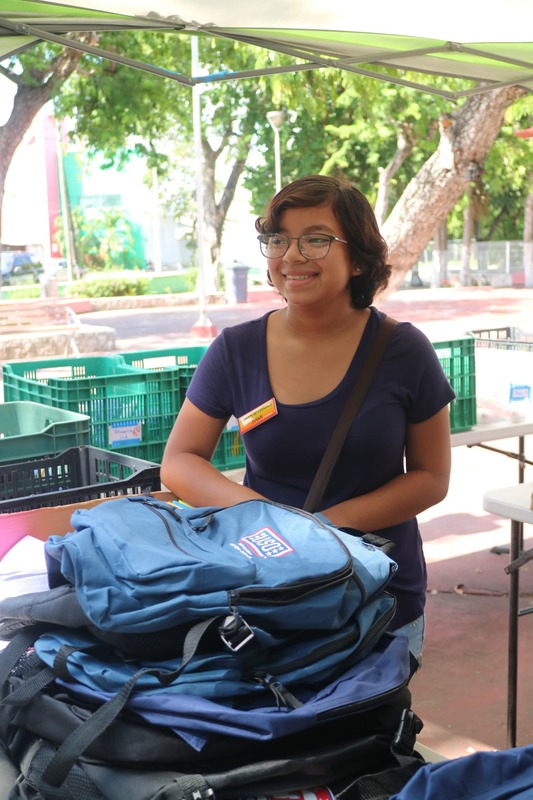 Donated backpacks and supplies help children attend school. The Bazar was one of several events in one week, capping off a visit from volunteers from the US. Many Friends of Cozumel volunteers make multiple trips each year and help with community outreach. Some even bring supplies on cruise ships making two trips off the ship with backpacks full of donated athletic shoes needed for children to attend school. 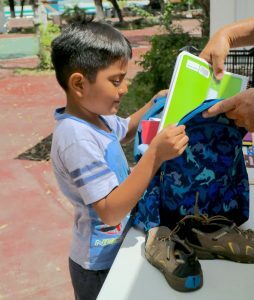 This is the ninth year that Friends of Cozumel has held their largest event, a back to school service which provides over 500 children with shoes, backpacks and school supplies. “We did 30 the first year, then we thought, let’s stretch to 50,” said Larry, one of the group’s founding members. Larry, his wife Karen, or local community leaders interview every family one-on-one during May and June to view the student’s grades and get their information. 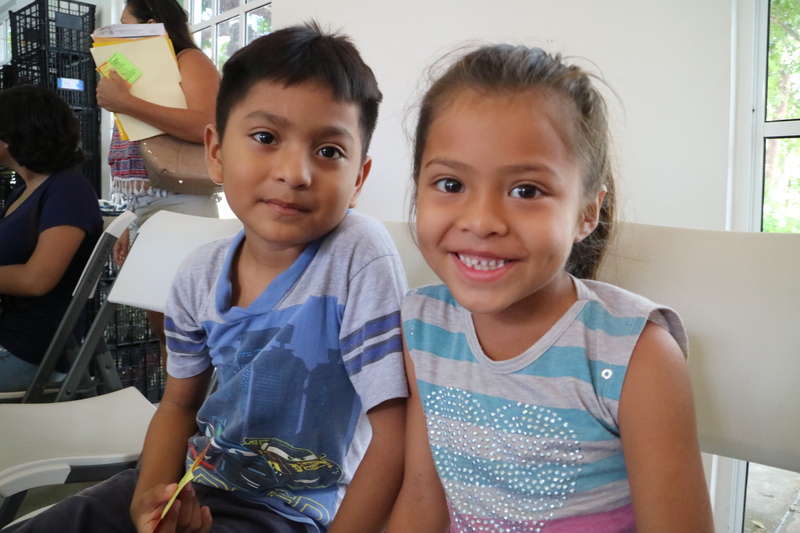 This year, they provided over 600 students with school supplies based on their specific grade and school. This year, FOC donated art supplies to the DIF senior center in exchange for use of some buildings in a neighborhood park. The long, rectangular building is in a central neighborhood and the volunteers were grateful for the air conditioning it provided. “It was a bit of a sweatbox without this facility last year,” Larry said. Students from kinder to university ages tried on shoes for school. Inside, tables were stacked with crates of shoes and families waiting as their kids are fit with a new pair for the school year. The quality and style of the shoes was fantastic and the kids were absolutely beaming. We sat down with Jabes, who helped a couple of excited kids try on shoes. 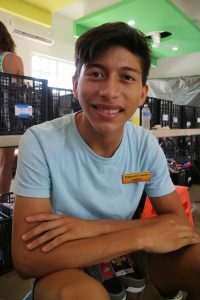 This was his third year volunteering with the group and his friendly temperament and bilingual skills were universally appreciated. “I love seeing the kids smiles when I put their shoes on,” he said. Jabes is a scholarship recipient who now volunteers at FOC events. The government provides teachers and classroom facilities, but the students are asked to purchase their own books and supplies, which can squeeze the family budget. “A family that has three or more kids, you don’t want them forced to make a choice of who gets to go to school,” pointed out Gary, a FOC volunteer at the backpack station outside. One of the group’s biggest needs is for Spanish speaking volunteers. Sami, a spritely Mexican girl with a bright smile, has been an active member of the group for several years and helped distribute notebooks and pre-packed supply pouches into the students’ newly selected backpacks. Sami has volunteered with the group from a young age. Sami is bi-lingual and a great help at FOC events. Nuria, Sami’s older sister, made a special contribution to the effort, helping to organize a health fair for older adults. 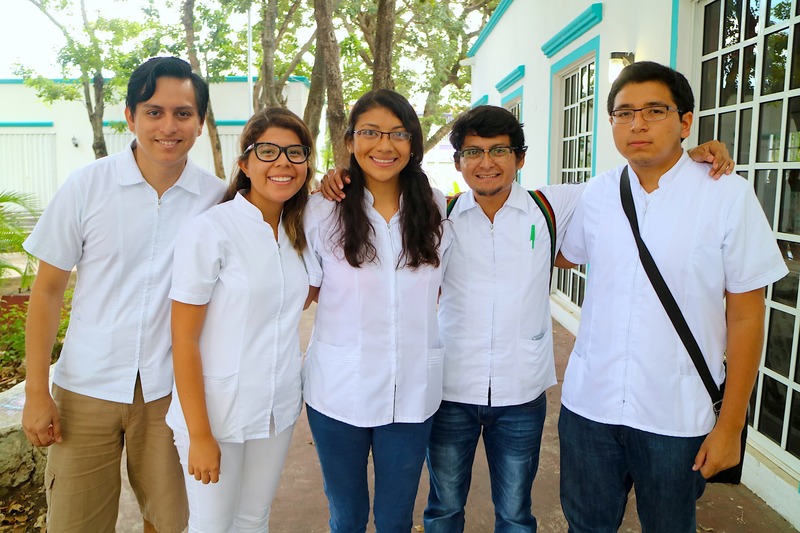 She traveled from the Universidad Autónoma de Yucatán back to her home in Cozumel, bringing a group of four fellow medical students to the event. The fifth-year students study medicine in Merida and money for their expenses was provided by a long-time FOC supporter. Nuria, Ricardo, Omar, Narciso and Daniela were excited to be part of the event. They took physical measurements including blood pressure, blood sugar, weight and height. They found that many of the adults they examined had abnormal numbers and many of those who were ill had poor dietary habits and exhibited early symptoms of diabetes. Fifth year medical students took a break from school to hold a health fair. Despite availability of resources for treatment, few locals ever see a doctor. “They believe more in what their friends are saying than doctors,” Nuria said. The medical students consulted with their patients, advising each on a next course of action. “Here, they don’t do preventative medicine,” added Larry. “You only go to the doctor if you’re too sick to cure yourself.” He sees a need for Friends of Cozumel to address these basic public awareness issues with classes on topics like food safety and medical care. Another aspect of the health fair for adults was a vision test and distribution of inexpensive reading glasses. Dozens of people were happy to receive the donated glasses that would allow them to read. The community is deeply grateful for the positive example set by the Friends of Cozumel and this year’s new medical team. Their efforts spur grass roots action and set up cycles of giving that will echo for years into the future. Thanks to all the volunteers making the future bright in sunny Cozumel. Appreciative smiles were easy to find on school supply distribution day. Check out Friends of Cozumel on their website and Facebook page. This entry was posted in Uncategorized on August 15, 2017 by pedersenll.